One of the most important tasks in Network Management is IPAM, which stands for IP Address Management. Every application and device on a network depends on IP and requires address assignment. And we become more dependent on IP as new core services like VoIP (Voice Over IP) and mobile networks become prevalent. As networks grow and develop, the need for a robust allocation, classification and tracking of the network address space becomes crucial to eliminate network conflicts and outages. This explains the need for IPAM. As a central control point, IPAM provides an authoritative source for information about the network. It also provides strategic insight and rich integration with core network services that enables an enterprise to drive more reliable service delivery, greater agility, improve security and lower the manual effort involved in administration. 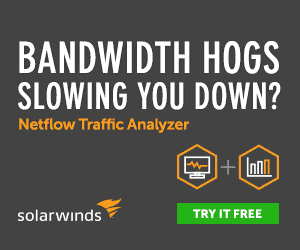 The Solarwinds IPAM, which starts at $1,995, offers a lot of great features that are easy to integrate in existing systems. 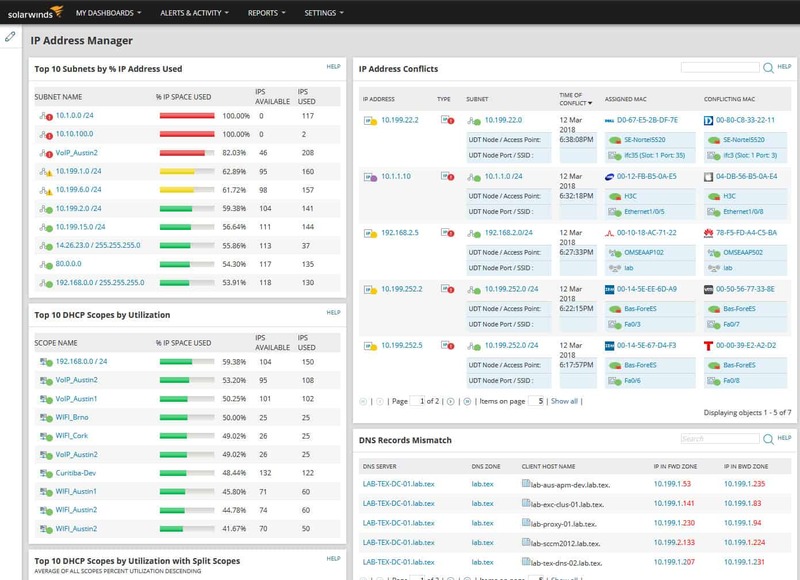 Easy to use and navigate, it is the best choice for mid-size organizations as it allows the monitoring of your entire address space from a single dashboard. It has the active scanning function that discovers and tracks IPv4 and IPv6 subnets and associated address blocks making it effortless to manage and deploy in networks. Automated IP address tracking. Always know how the IP addresses in your network are being used through automated subnet discovery and IP scanning. Integrated DHCP, DNS and IP address management. 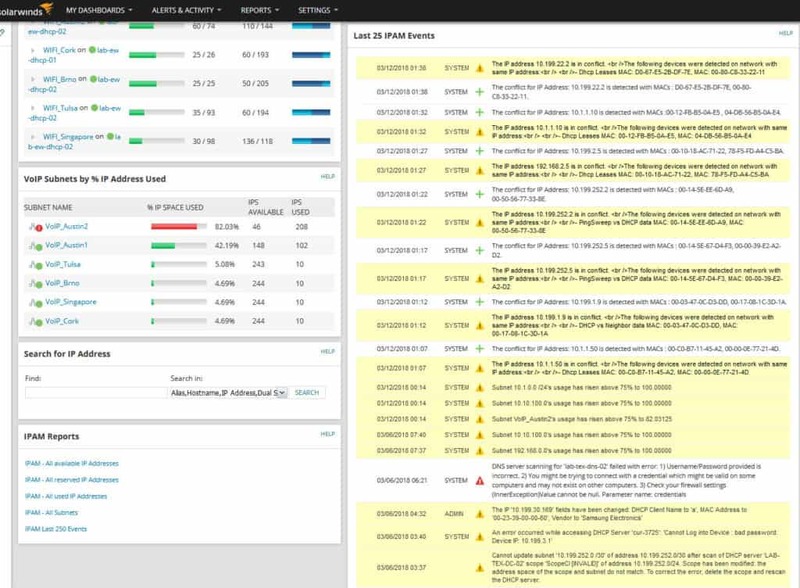 Save time and enhance network reliability by monitoring your entire address space in a single dashboard. IP alerting, troubleshooting and reporting. Receive an alert and troubleshoot IP conflicts, depleted subnets, scopes and mismatched DNS entries. Multi-vendor DHCP and DNS support. Have the ability to centrally manage and monitor Microsoft, Cisco, and ISC DHCP servers as well as BIND and Microsoft DNS servers. 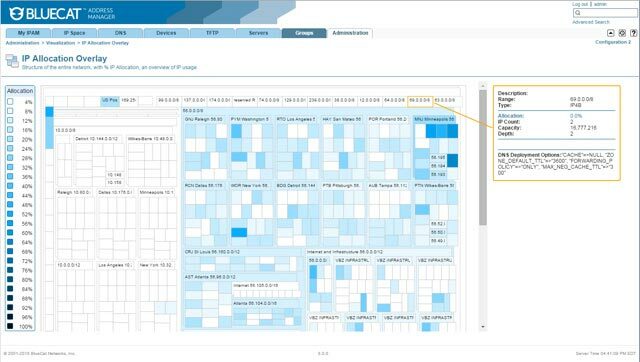 Integration with VMware vRealize Orchestrator. Be able to automate virtual machine IP address management with vRO plug-in. 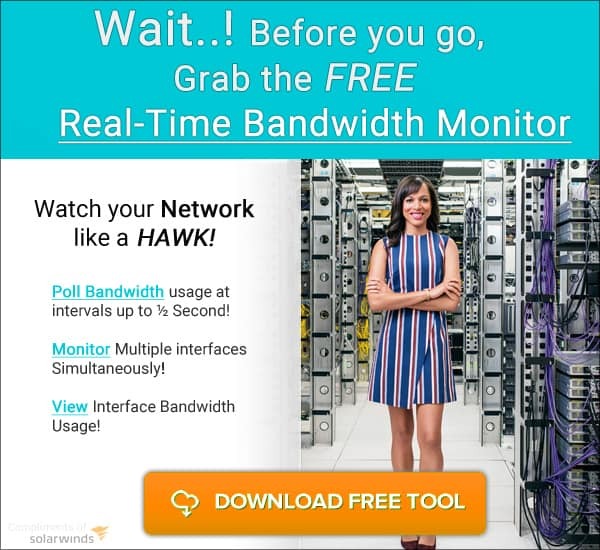 Solarwinds also Offers a FREE IP Tracking Solution that is Limited in the Amount of IP Addresses you can track, but its a great Starting point. Fully integrated with their industry-leading Grid technology,Infoblox IPAM provides enterprise-grade, automated core network services for public and private clouds and virtualized environments. With the Infoblox tool, DNS, DHCP, NTP, FILE distribution and IPAM are all integrated into one console. The biggest advantage of Infoblox is the fact that it is highly scalable. This is because of its signature Grid technology that allows the various databases to be distributed and replicated throughout your environment. Infoblox makes it easy to work with high-volume databases by having the ability to export the data into a CSV file, use Excel to make the modifications, save and re-import. BlueCat Network’s incorporated software distributions of their applications enables you to run it on any virtual machine in your environment. It’s IPAM tool provides a user-friendly interface and it’s particularly quick and accurate in gathering all the usual data in a network such as the IP address, DNS, DHCP lease, host records and mac addresses. Their software is mostly used for enterprise environments especially where DNS or IP configurations are constantly updated. The BlueCat Networks currently offers the Proteus™ family of IPAM appliances which features next-generation, web-based, IP address management solutions and the Adonis™ family of DNS/DHCP appliances which are end-to-end, fast, intelligent, cross-platform, secure DNS and DHCP solutions. BT Diamond IP is the most affordable of all the items mentioned on this list. It is available as an appliance or as a software install for your own hardware. 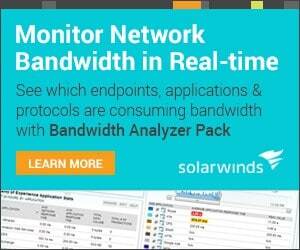 It integrates well with existing DNS and DHCP services in your network. It offers a fully-staffed managed solution making it ideal for companies with a small IT department or those who don’t have a centralized IT staff. It supports IPv6 as well as templates and extensible attributes that allows you to have extra information attached to your networks and hosts. It is also comes with a 24/7 tech support. LightMesh IPAM software offers the same functionality as the others IPAM softwares out there but its user-friendly and sophisticated UI is the reason why it stands out among the rest. It does a very good job at presenting the data and information in a way that is intuitive and efficient. It starts at $200 per month and is a simple solution for enterprise environments. 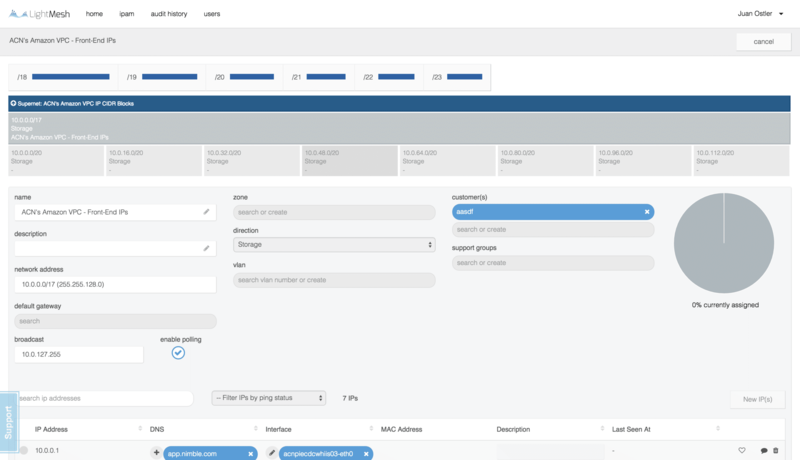 LightMesh IPAM easily integrates with existing DNS and DHCP servers to provide you with a view of all your IP, DNS, and DHCP data regardless of where it resides. 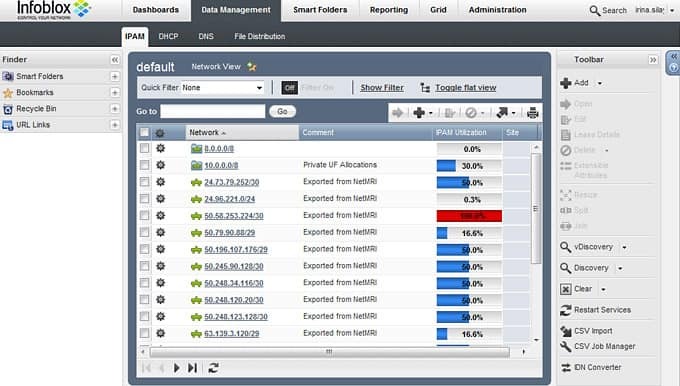 All of the IPAM tools mentioned in this article provide the same functionality and services: IP address, DNS, and DHCP management, Network Monitoring and discovery, Reporting, Alerting and more. The key difference is in the features each of them showcase. And the solution depends on your existing environment and network needs.